“We’re pleased with our harvest, but our key achievement this year was completing a rolling team." The Hands Free Hectare (HFHa) team has successfully harvested their second crop using their autonomous combine harvester and achieved unloading on the move for the first time with their ISEKI tractor. The world-first project, run by Harper Adams University and Precision Decisions, returned in November of last year after receiving funding from the AHDB to grow a crop of winter wheat, with the aim to improve the machinery’s accuracy and so improve field coverage, ultimately leading to a more competitive yield. Drilling misses fell from 2.82 per cent in the first year of the project to 0.35 percent this year, helping the team achieve a respectable overall yield of 6.5 tonnes, despite a late drilling and busy schedules. Mechatronics Engineer for Precision Decisions Martin Abell said: “We’re pleased with our harvest, but our key achievement this year was completing a rolling team. Last year, we tried an unload on the move, but we weren’t able to get out tractor close enough to the Sampo combine because of the accuracy issues we were experiencing with the control systems at the time. “We have continued to make improvements to our system on the tractor, including adding an auto-start so we can start it remotely if required. We enhanced the auto-pilot in time for drilling which led to improved driving accuracy and therefore an increased field coverage. “Thanks to these improvements, this year, we were also able to run the rolling team; unloading grain from the combine into a trailer behind our tractor which was running alongside it, which makes the harvest process far more efficient and quicker to complete. This was something we’d talked about doing before the project had even begun; we’d laughed and joked and said it would be the icing on the cake and it was great it worked this year. Alongside harvest, the team invited Caroline Dawson from local catering company Fodder in the Field to cook fresh pizzas at the side of the hectare, using ‘hands free’ wheat from the field itself. But what’s next for the team that has exceeded all expectations? Jonathan added: “We’ve been working on this project for the past two years to really tight deadlines. We’re really pleased with what we’ve achieved; starting out with nothing in October 2016 to being able to drill with the tractor in May 2017, harvesting in the September, and then turning everything round ready to plant the wheat for a second growing season in November. “For the next year we’re putting a cover crop into the hectare, this will protect the land as we use it as a test space while we continue to improve our technology, which we haven’t been able to do while growing cereal crops in the field. “During the past two years we’ve come across a number of technological challenges that we simply haven’t had the time to overcome. This next year is a great opportunity to address them. Kit Franklin, Agricultural Engineering Lecturer added: “We’ve had an amazing couple of years, and we’d like to thank all of our sponsors and supporters for all of their help; we couldn’t have done it without them. “From the first year of the project, we gained worldwide attention, with articles, blogs and broadcast items appearing in 85 countries. Following this, we were invited to talk at conferences and events in various countries, including me speaking at the prestigious Oxford Farming Conference at the start of this year, which to achieve at only 27-years-old was amazing. “Then in June we held live demonstrations of the combine harvester at Cereals, which was the first time it had been operated outside of the plot at the university. Although the first demonstration didn’t go to plan the second went incredibly smoothly, but that’s what we’re all about. We want to share the bumps along the road; the warts and all. This is the first time it's ever been done in the world, so we always knew it wouldn’t be easy. “The successful demonstration was then followed by a rush to get from Cambridge to Bristol for the BBC Food and Farming Awards, where we were extremely pleased to be awarded their Future Food Award. 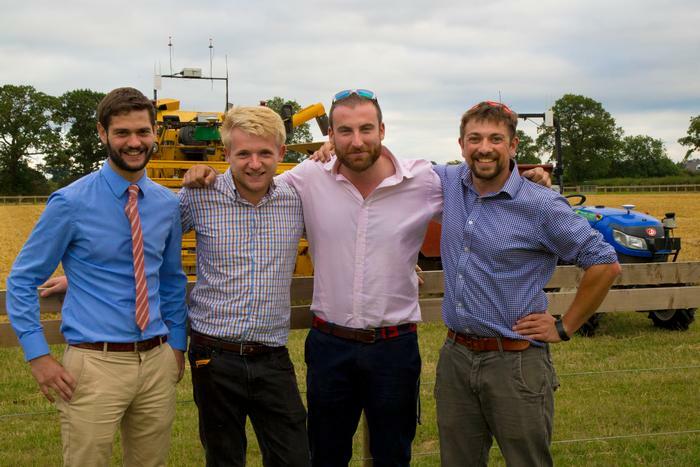 “We’ve also been to Buckingham Palace this year, where the University was awarded its Queen’s Anniversary Prize, and we’ve received the Institution of Agricultural Engineers (IAgrE) Team Achievement Award.